Shreya Prabhakar grew up in Greensboro, North Carolina. A student at UNC-Chapel Hill, she is pursuing her undergraduate education in biology and economics with a minor in chemistry. In 10 years, she hopes to be a pediatric neurosurgeon, while contributing to research in diabetes. In the following article, Shreya discusses the benefits of shadowing as well as common questions on the subject. My favorite childhood toy was my little doctor kit. After visiting the pediatrician, I would pick up my plastic stethoscope and kiddie syringe and practice the same procedures on my stuffed animals. I considered myself a natural and knew that I wanted to be a doctor someday. Over a decade later, nothing has changed; in fact, my desire to earn that white coat is as strong as ever. Yet, despite my certainty, I’m strongly aware of the gap between my perceptions and the reality of a doctor’s life. 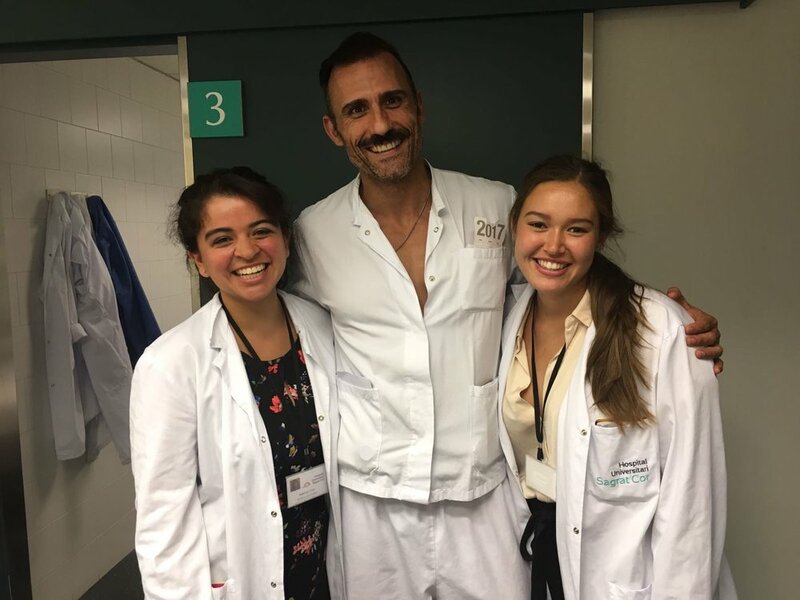 Although I volunteered at the hospital, attended health symposiums and competed in healthcare sciences competitions, it was only after I shadowed that I really began to understand the true nature of a medical career. When I first shadowed a couple of months ago, I learned more about the medical field than I had through all my prior experiences. Riding to the clinic with my physician, discussing the academic path she followed, reading up on an array of diseases and discussing them in between patient consultations gave me invaluable insights into internal medicine. Although I entered my shadowing experience with zero interest in that specialty, the experience left me eager to explore how I could get further involved. Knowing the clarity and knowledge I will continue to gain, I eagerly await my next shadowing experience. Meanwhile, I’ll strive to answer some of the common questions pre-meds might have regarding shadowing. When I first shadowed a couple of months ago, I learned more about the medical field than I had through all my prior experiences. Riding to the clinic with my physician, discussing the academic path she followed, reading up on an array of diseases and discussing them in between patient consultations gave me invaluable insights into internal medicine. Shadowing is the specific and intentional observation of interactions between doctors and patients. It typically does not include direct patient engagement; however, some patients may ask questions about school and career goals after the doctor has introduced you and asked permission for you to observe. Shadowing is advantageous for several reasons. Unlike most other career fields, you cannot intern in medicine without having attended medical school. Thus, shadowing is the best way to find out if a medical career may be right for you. It will give you a glimpse of the nature of a physician’s typical day, and help you become familiar with different medical and research settings. Additionally, it will give you the chance to discuss your applications and interviews for medical school, and gain personal insight into doctors’ lives outside of work. Note that doctors are not required to teach you. In fact, how much you learn depends on you. Naturally, a higher level of engagement with the physician you shadow may lead to mentorship or a positive letter of recommendation. Doctors are not required to teach you during your shadowing experience. In fact, how much you learn depends on you. Keep in mind that a higher level of engagement with the physician you shadow may lead to a possibility of mentorship or a letter of recommendation. Why do medical schools want you to have shadowing experience? Having shadowing experience under your belt shows admissions committees that you have the commitment to pursue a medical career, since you took the initiative and spent hours observing physicians before applying to medical school. It also demonstrates your capability of becoming a medical student and resident, as both spend a fair amount of time not only practicing alongside a physician, but also merely observing. Are shadowing hours a necessary prerequisite for medical school? Shadowing is considered a crucial part of the pre-med experience in order to clarify professional goals and contribute to medical school applications. That being said, most medical schools do not explicitly require shadowing experience; rather, most admissions committees highly encourage it. These 40 hours do not have to be under a single physician or within a single week. In fact, shadowing several physicians over a number of months or years will give applicants the chance to familiarize themselves with different medical specialties, and allow them to compare different styles and settings of medical practice. To conclude, before applying to your prospective medical schools, check to see whether they have stipulated the minimum number of hours they want to see on your application. If they have no such requirements, go above and beyond to find opportunities. After all, your commitment and dedication should stand out from the competition. Note: Certain D.O. schools and institutions that offer degrees in osteopathic medicine require shadowing. If you plan to pursue this medical path, start contacting physicians for shadowing opportunities right away. Most medical schools do not explicitly require shadowing experience; rather, admissions committees highly encourage it. How do you find shadowing near you? Often, the most difficult part of shadowing is finding a physician who is willing to work with you. Doctors tend to prefer medical students over undergraduates when it comes to observation, as the former have a more coherent understanding of medical situations and the hospital setting. Because of this, undergraduates are not only competing with each other for shadowing spots, but also against more experienced graduates. In order to tackle this problem, here are some tips to help you secure a placement. Make a list of people to contact. Some of you may have parents who are physicians, and in that case, finding someone to shadow may be as easy as tagging along for a day or having your mom or dad make a call to a fellow physician. For those to whom this doesn’t apply, reach out to any contacts you have in the medical field. One of these people can be your family doctor. He or she will probably be thrilled to know that you are interested in the field and will support you as much as possible. Likewise, you are most likely to get a response back from other physicians you may know, and they can also refer others who will take you under their wing. If you have already exhausted your contacts, start by making a list of medical specialties that you want to explore or are interested in pursuing. Remember that admissions committees like to see multiple specialties on your shadowing resume as it shows you have a more informed, holistic perspective in the field. Go down your list and contact everyone. Email, call, or stop by their office to introduce yourself and convey your interest in the opportunity. Communicate formally and politely, and if you’re writing, include your resume to display your academic background and accomplishments. It’s better to reach out to more than a few physicians, as some may not get back to you. Once you’ve heard back and have set a date with the physician, read up on the profession beforehand. Research some of the diseases and ailments that they treat and make note of any questions you may have. Dress in business casual when shadowing. Bring a notebook and observe attentively without disrupting during each case. Ask the physicians questions afterwards and make note of the answers. You will get the most from your experience if you observe attentively and take good notes. Don’t be passive. Engage with what you’re learning as much as possible. Show interest even if you have none, as many clinical experiences can turn into opportunities to gain letters of recommendation for future endeavors. Shadowing duration varies. Find a time that fits both your schedule and that of the physician’s, and take into account your level of interest in the specialization. You may only want to spend a single day with them, or you might want to observe for a few hours a week over a period of several weeks. The committee at Johns Hopkins University recommends that you shadow a physician for enough time to be able to speak informatively about your experience, as well as the profession, once you have finished. After you’ve completed your rotation, send a handwritten thank you note to your physician, thanking them for their time and acknowledging how much you’ve learned. Doing so will leave a positive impression that can influence the letter of recommendation they provide you. After you’ve completed your rotation, send a handwritten thank you note to your physician, thanking them for their time and acknowledging how much you’ve learned. As you’ve hopefully seen from my tips above, shadowing is a vital part of the pre-med experience. It gives you the most raw sense of what’s to come, and provides you a chance to see what truly sparks your interest. Shadowing can validate your medical aspirations and elucidate whether your time and effort is best channeled toward a specific specialty. To take action, begin your shadowing endeavors by looking through your contacts, reaching out to doctors, and exploring which specializations you’d like to explore. Get ready to scratch the surface of medicine and find answers to questions you didn’t know you had. After all, learning in medicine is a life-long journey. Start yours today.